One Bee of a Headache! 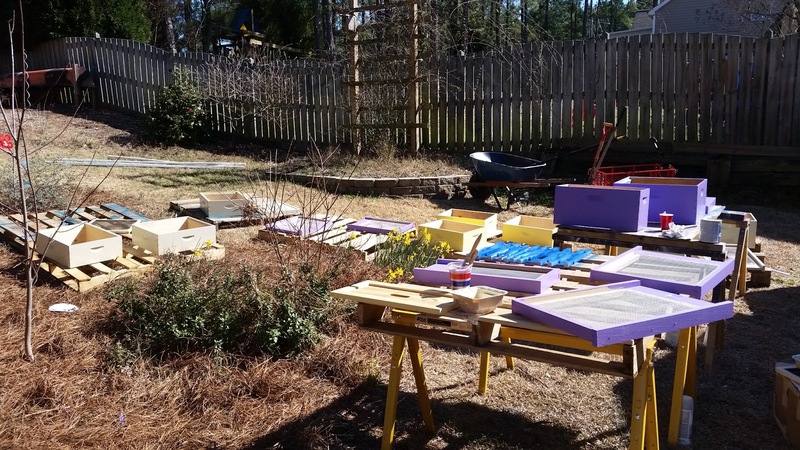 We’ve had a good weekend working in the yard and painting hives in preparation for the bees we’re getting from the South Carolina Beekeepers Association on March 19th. 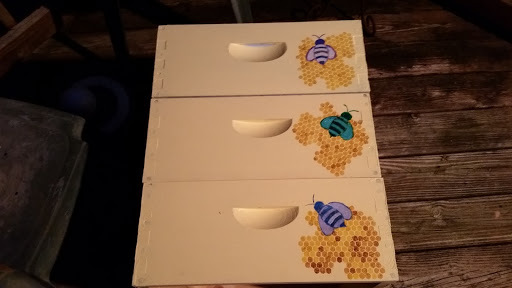 We have enough hive bodies built and painted to accommodate the newcomers, and I’ll spend evenings this weekend decorating them and using the wood burning tool to permanently add our name to each piece of equipment. 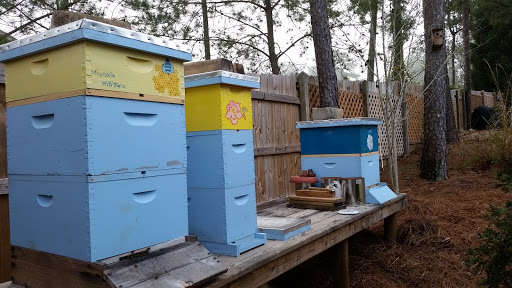 We did some hive maintenance and found good supplies of nectar, pollen, and brood and no evidence of mites or wax moths. 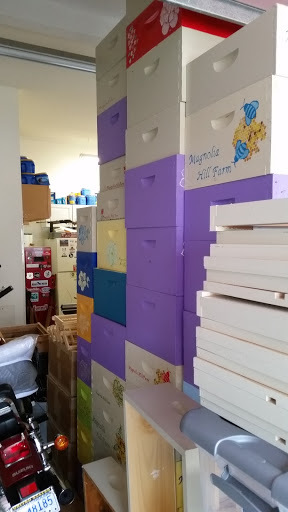 After I cleaned up a little, I decided to take one last look at the hives before coming in to grade essays. That’s when a bee got itself tangled up in my hair band. I’m used to bees buzzing through my hair when I’m standing near the hives, but they have never stopped to say hello before today. When I pulled my hairband off, the angry little critter was still saying hello to my headband with its pulsating stinger! Now, all previous stings have been minor nuisances, but this one is giving me a headache like I haven’t had in years — despite the toothpaste rubbed into my scalp. But, back to positives….. we have almost everything painted that needs painting, just in time for the nucs that were on backorder to arrive on Tuesday for next weekend’s painting marathon! 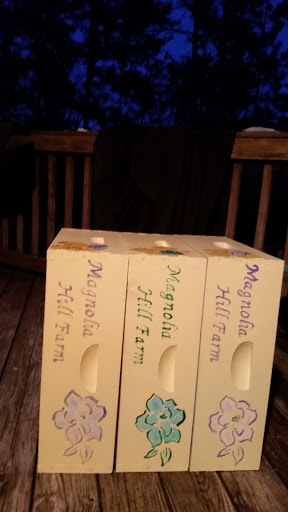 I am getting closer to finding a good sized font for the name of our farm and I’m even getting better at painting the farm name free-hand. This kind of work outside in the spring sunshine is the perfect antidote to the stress I felt by the end of last week. It’s not that the week was much different to others, but at one point I thought I was caught up on the tedious side of teaching, such as filing paperwork and grading, and then I received a stack of essays to evaluate by Tuesday….. I will be able to score them relatively quickly, but I did so want to feel caught up for just one afternoon! The seeds I planted last weekend are also trying my patience, but I checked the seed packets and saw that germination time for all of them is anywhere from 7 – 14 days, so I’ve resisted the urge to dig around in the potting soil to see what they are doing. But while painting I’ve been able to look at the first daffodils and crocus blooming. The bees are bringing in four different colors of pollen, and lots of it. 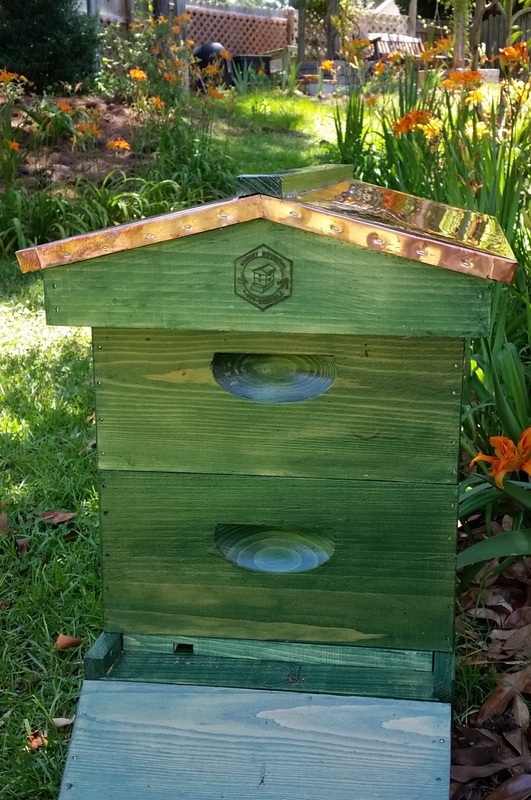 Yes, my head still hurts, but it’s still a beautiful day and I look forward to seeing our bee business grow. (And to spring break and a week on the farm!) Life is good.